In many ways, this review is pointless. I have almost no doubt in my mind that anyone who watched all of Major Season 1 will watch Major Season 2, whether I say it's great or terrible. But, just allow me to reassure you, Major Season 2 is as good as it gets. I rated Major Season 1 a 9/10. It was exciting, but it had a few things holding it back. The first half of the season didn't have that much in terms of baseball games, there was a lot of romance subplots that were tough to care too much about. And, it was kind of ridiculous to see little leaguers practically playing like pros. Major Season 2 comes in and fixes just about everything that was wrong with Season 1. First off, the show has baseball games right from the start. There's only a few episodes of building up to the big games, they get right into it, which is awesome. 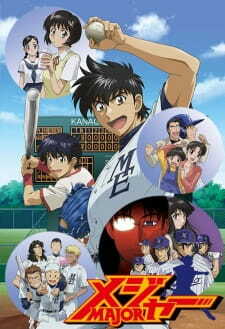 In keeping with the theme of more baseball, all the subplots this time around revolve around baseball as well. There isn't any silly parent/kid drama like last time. No romance subplots. The entire plot revolves around what the anime is supposed to be about. Also, the games seemed a little less ridiculous this time. I mean, there's still some crazy plays. But the fact that they are in high school now, and not a bunch of little shrimps made it so my immersion wasn't ruined by it this time around. I think the plot is a lot more interesting and innovative this time around as well. Season 1 was your standard story of a boy wanting his team to become the best. This time around, the story revolves around high school powerhouse Kaido, and Goro's interactions with them. There are some surprisingly good plot twists, and I found the story to be a nice breath of fresh air. The art and sound are once again great. I thought they did a good job drawing the older versions of everyone from season 1, the music is good once again. Overall, if you watched Major Season 1, you probably liked it, and I have no doubt you will like season 2 as well. Writing review for other seasons is a bit pointless but I really feel like talking about it. I'll try to keep it short and straight to the point. I really liked season 1 as well as the movie but this season I found quiet annoying and the main reason for that is Goro himself. As you know he is a determined and stubborn guy who does deserve some admiration. However this time it was brought to whole new levels which I did not appreciate. One good thing is that Goro learned not to bash his team mates when they miss the ball but did it make him a good team mate? No. He still is as self centered as usual if not more. It's all about him! "I'm this this, I'm that and all of you are trash." though it was put in a much nicer way. He never gives mound to anyone and gets totally irritated when things don't go his way "Put me on the mound, put me!". Yes, he does have better skills than some others but you don't have to rub it in their face! If you are that confident in yourself then make up for their minuses later on instead of glaring daggers at them and taking fun away from them! With his logic you don't even need other pitchers in the team! If he doesn't change his way, I'll be surprised if other pitchers won't try to quit from the team. Another annoying thing is that he never learns! He broke his right shoulder and do you think it made him realize something? Nope! He still pushes himself like before, not giving a damn about future. he is so stuck up in present that it makes you wish that he would break his left shoulder too so he could finally learn the lesson! There is a thin line between being cool and an idiot and he usually goes onto the side of idiots. Again, once it comes to fight for the dreams guess whose dreams come true all the time? Being MC sure is a blessing, too bad none of us is one in real life. There were also barely any games this season, I mean game variation. Because one game managed to last for 5-6 episodes! And there were 2 games like that! All together it's already almost half of the season! Where is some kind of variation?! Most of new characters were plain and barely looked fun, the designs became quiet lame too. However, what I really loved in this season was the whole training arc on the island. It brought in more depth to the series as well as realism. Besides it is good to see what kind of exercises are there. Actually the whole examination process was fun with all the tests.Also we learned few more techniques and names for them. Over all I'm left disappointed. Was thinking about mark 7 but I guess I'll stop on mark 6... I honestly hope that next seasons will be more exciting with some interesting characters and that it won't be Goro centered. I know that he is the MC but it doesn't mean that he has to be mister invincible whose dreams always come true and who always gets it his way. Just because you train all the time and are a prodigy, doesn't get you away from the injuries, loses and troubles. Feel free to disagree with me but that's my opinion. Goro needs to get off his high horse. This is the best season for your inner child that loves to watch overpowered characters and one of the best in terms of rewatch-ability. i have watched quite a few sports anime, although i haven't been on the site long so i dont have list, but the middle of this season seams to be an endorsement for programs that arnt for everyone. and my impression of goro from the first season through to the first half of this season suggested his baseball and his character traits are not a match. to me goro became a emo coward who really didn't deserve to be the main character after this point (epi 11). since i loved season one im still going to try giving season three a chance but season 2 is dead to me. just a bad dream.